"The addition of garlic mushroom soup mix gives this dip some kick! Serve a French baguette, crackers or crostini alongside this steaming dish to give your guests something to dip into it with." 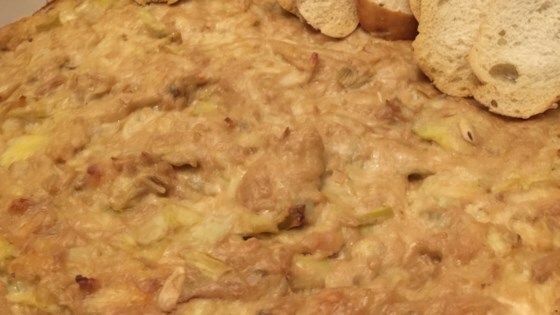 In a 1-1/2 quart casserole dish, combine mayonnaise, sour cream, soup mix, artichoke hearts, cheese and crab meat. Mix well. Bake uncovered for 30 minutes. Serve immediately. I thought the soup was too over powering for the dish, extremely rich. Made this wonderful appetizer for Xmas Eve. It was gone within minutes. Planning on taking it tonight to bring in the new year. This time, however, I'm doubling it! Just the recipe I have been looking for. I also go to Skates by the water in the Bay area for this dip. And now I finnaly found the recipe. Good looking out. Now I can get more for my money.